Needed a break from the work routine and what better way than visiting a trek spot which includes a bonus of burning calories as well. 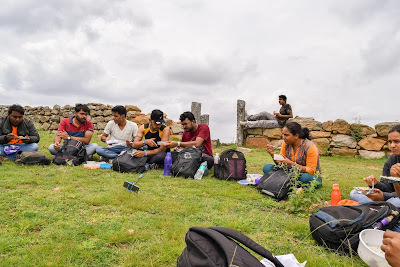 I joined Bangalore Trekking Club (BTC) in June as soon as I received my first invite to register for the trek to Ramadevara Betta, I registered in no time and immediately messaged my friend Raghu to do so as well…and guess what, the trek registration closed in just half a day. Within a day or so, received an official mail from one of the trek organizers, Ashish (the other being Vikram). 23 members were shortlisted and the trek was on..8th July was the day!I had been on multiple treks before including some Himalayan treks but hadn’t thought of joining an official ‘trekking club’ until only recently; so looked forward to my first trek with BTC. 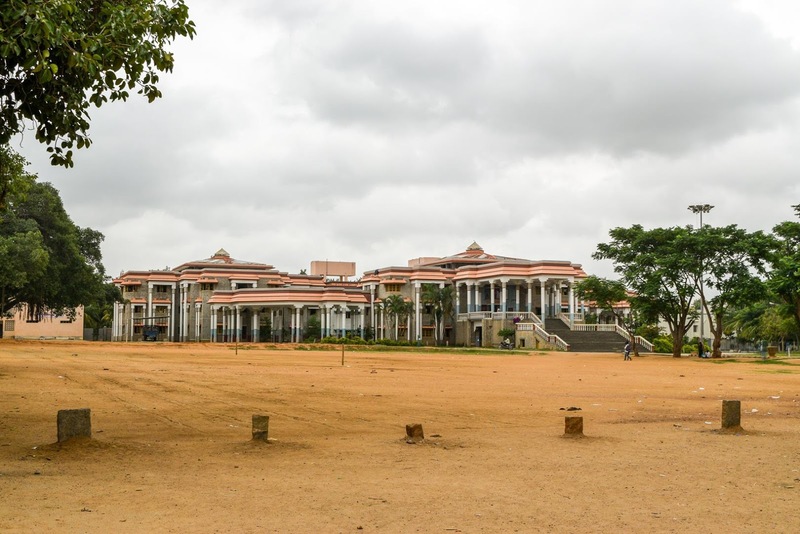 Our presence was require at the station by 6.45 a.m which unfortunately meant waking up really early in the morning.I caught the bus from Indiranagar at 5.45 a.m and reached majestic railway station, our assembly point by 6.10 a.m. Early but it gave us time to finish our breakfast at the railway canteen. We caught up with Ashish by 6.30 a.m and waited for others to join. Folks joined in one by one and soon enough we were 12 members already as Ashish went to purchase tickets. Our train was scheduled to leave at 7.30 a.m. and we weren’t really sure all would show up but hoped so. 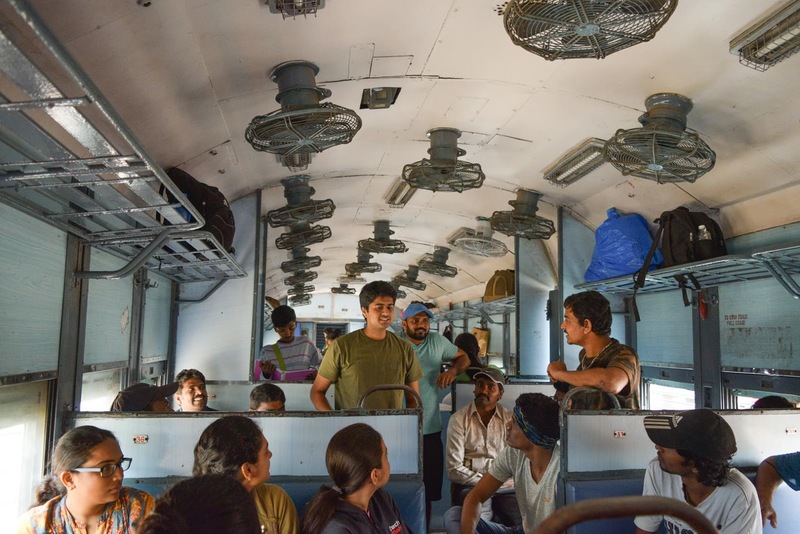 We huddled into the train, the Hubli passenger and managed to locate an empty compartment; lucky us ! . Additional BTC members joined in at Yeshwantpur ;there were 23 of us and journey had begun.It was a decent mix of experienced trekkers and beginners, the youngest of group being Amy who was only 7 years old. To break the ice, every one introduced themselves and Ashish started a fun game of dumb charades with movies. He proved himself to be encyclopedia of Hindi movies(I hadn’t even heard of guessed movie names , let alone guess them”tutak tutak tutiya, sarrasnsh, Dr fadnis something…”,when did these movies even release !). 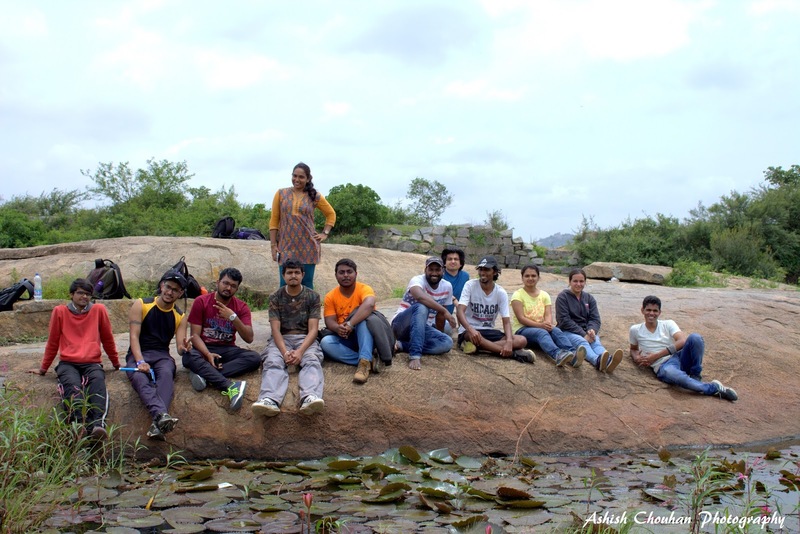 Time just flew by with the very fun and energetic group and we reached kyatasandra in about an hour’s time. 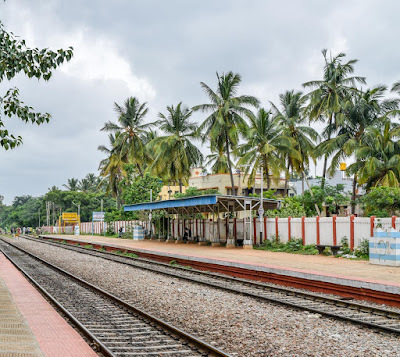 Post disembarking, we were given a reminder of the strict “BTC rules” and we started off from the very clean kyatasandra railway station. Kyatasandra also happens to be the location of the siddaganga mutt and is very well maintained town.We started off to the base camp and guess what, another BTC member, madhumita also had done the same Himalayan trek as me. (the chandrashila trek). We ended up discussing the wonderful deorital-chandrashila trek while walking to the base of ramadevara Betta. The weather was perfect for trekking, cloudy with a bit of chill; the sun had played spoil sport on too many of my previous treks. 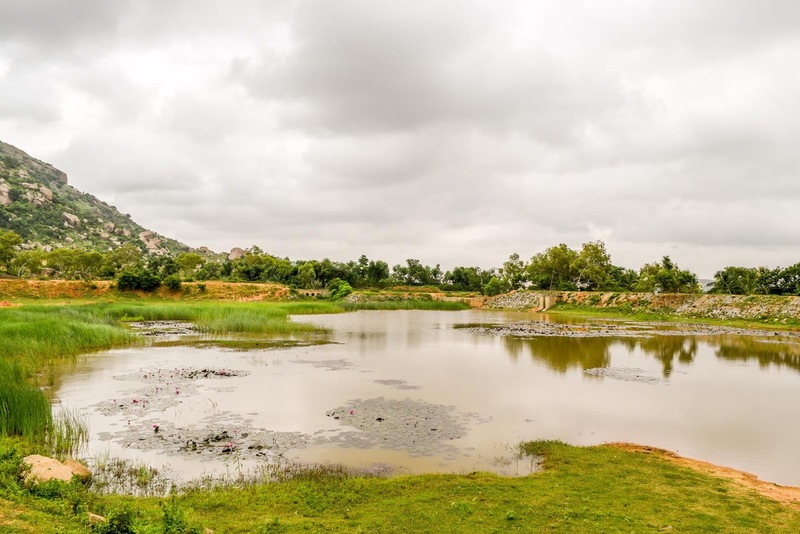 The base of Ramadevara Betta can be reached by passing through the siddaganga school grounds and hostel, there is a well paved road which leads to lake and the intimidating Ramdevra Betta comes into sight. A decent bit of vegetation and trees were visible which could catch a break in some shade, just in case the rain gods decided to move to another location. We started off from the base and made our way through lots of thorny Bushes and slippery terrain; The decathlon shoes proved their worth. While I was thinking about my good value purchase, there was a loud shout about part of the group wandering off on a potentially wrong path. Retraced about 50 steps and we were back on track. The landscape view became better with every 15 mins of climb and covering a few hundred feet. Ramadevara Betta is surrounded by lakes but unfortunately many of them were dry;fortunately not all.Frequent aqua break replenished our energy and Manju kept us entertainment with his philosophy on nature and by extension “natural”. Many BTC members now swear to keep off all natural products from now due to transformation impacts on the discussion Ramdev Baba’s products including the “baba beer” , best in it’s hypothetical class of products were given decent amount of promotion as well. 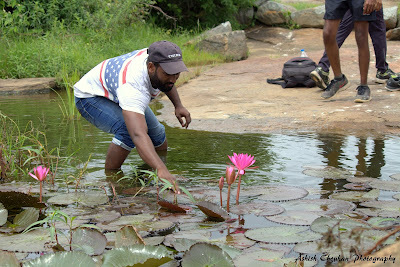 After an exhausting but awesome trek of almost 2 hours , we reached the peak and we were greeted with a wonderful sight.Multiple small ponds with lotus flowers in the middle of the ponds. Vinod Tried to get some lotus flowers for himself but was largely unsuccessful in his efforts I think.The hill top is has very large region for ‘exploration’ but almost everyone, quite exhausted from the trek decided to just relax it out for 45 minutes or so and take in the wonderful cool breeze and beautiful view of kytrasandra town. And of course, after rejuvenating rest can only lead to a session of selfies and photography which obviously the entire group was a part of. 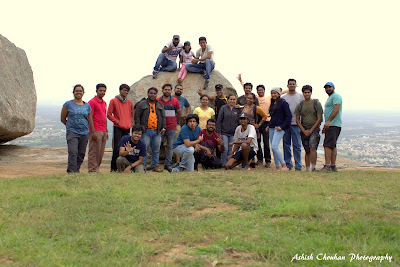 Manju, Sachin, Vidya and a few other daredevils went to edge of the cliff for a click. 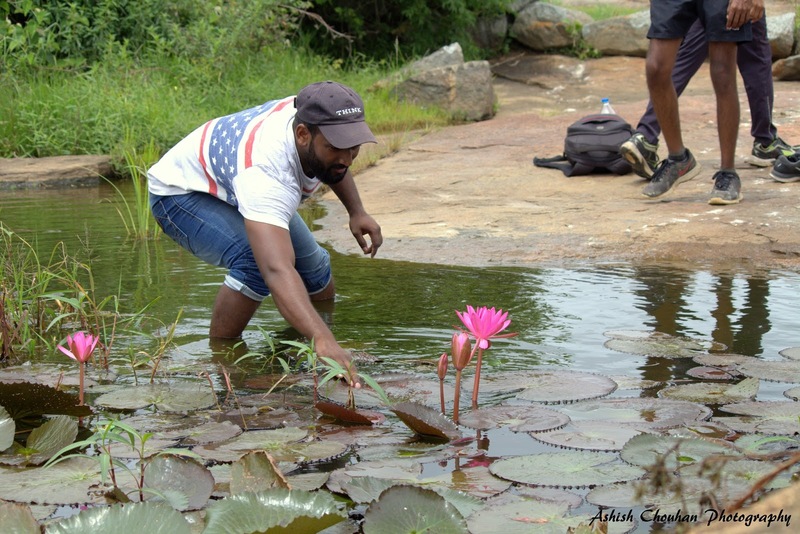 In the mean time, we also spotted many school kids from the siddaganga school coming into hill top pond to cool off. What was a ‘one time event’ for most of us was a actually a weekly event for all of them. After a hectic session of photography and selfies, it was finally time for the BTC team lunch, a simple pot luck really wherein the non selfish members pass on the food for others to critique on with everyone sitting in a circular formation. It was definitely one the highlights of the day. Manju’s specially prepared ‘natural fried rice’ and megha’s poha were delicious. Akash especially went gaga over the poha. We ended our meal with the delicious broken wheat savory prepared by megha. I managed to get a spoonful in the first round, it never came back for a second. It was definitely a good meal at 4000 feet. A 4km long up hill trek and a hearty meal, how can one resist a nap? While not on the cards of the organizers, trekkers went against the norms and many had a hearty nap for half hour. Others engaged themselves in technical discussions & growth of technology. The loud scream of Ashish woke everyone up from their slumber and it was time to explore rest of the hill top. On one side of the hill top, there a rock formation which which is perched steeply on side of the cliff. Many BTCians in fact tried to push the rock off the cliff but were unsuccessful; the gods wouldn’t allow it. You see this was right in front a small cave dedicated to lord rama.We took our last group photos of the day here. The trek down was not as eventful as the one going top but fun nonetheless. The group split of significantly here wherein some pretty much raced to the bottom in 40 mins or so while others took a little more time. And of course, we lost track of the route some where mid way again and many ended up taking the steep route down which was quite hilarious to watch. 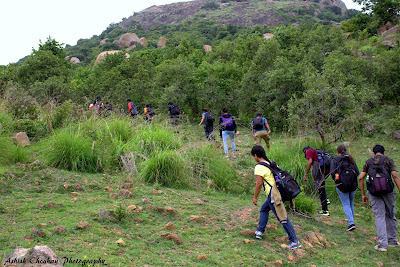 But all in all , everyone made it to the bottom of the hill; safe , sound and satisfied with the trek. Our train to bangalore , the hubli passenger was scheduled to leave for bangalore at 4.30 p.m but we had lots of time in our hand since we were at the bottom of the hill by 3.15 p.m or so. The slow walk back to the railway station was bitter sweet in a way. Bitter since we had reached the end of a wonderful trek and sweet since we got our hands on freshly cut jackfruits which were yummy, all part of the BTC package. The organizers asked the feedback and everyone was unanimously satisfied with the trek. 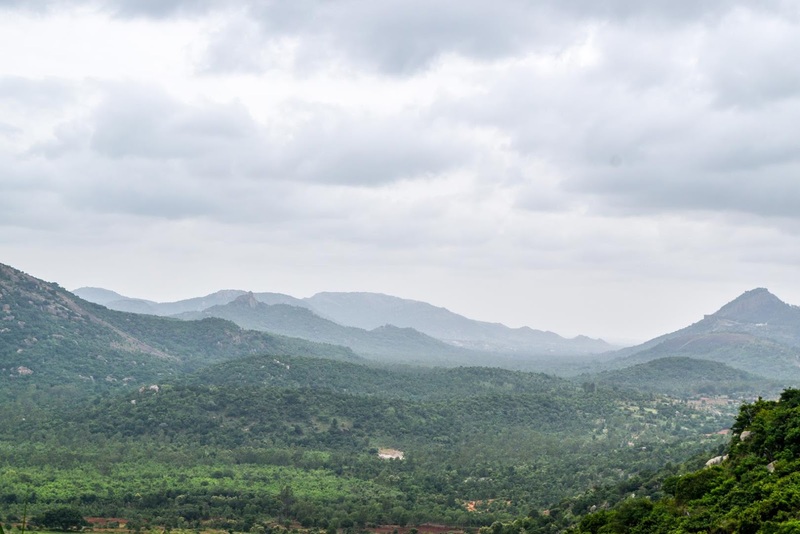 The hubli passenger was right on time at 4.30 pm but wait, the journey back was not boring. Snacks and biscuits kept popping out of bags and Manju gave an interesting rendition of “gabbar from sholay”. We reached BLR by 6.30 p.m and it was time to say our good byes while we filled our water bottles for a meager 5 rs at the IRCTC counter.